The original goal of this project was to have a compact octal tube OTL headphone amplifier that would drive low impedance headphones (down to 32 Ohm). I also wanted an external choke. All those needs forced a custom PCB. RAMSEY SHA-1 stereo headphone amp. ( DIY kit only ， you need to solder the components and board by yourself. ). 1, AC 12V input Power Input: AC 12V 1A/5.5 X 2.1 plug. 3, the output of the left channel / right channel output Included: 1 X Pre-amp Tube Pre-Amplifier Board Kit. 2, the left-channel input / right channel input. Reference Baia A2 original circuit design, combined with their own ideas designers redesigned and improved A2-PRO professional headphone amplifier with professional-grade monitor sound quality, sound step. With reference to the original circuit design of Baia A2, combined with the designer's own ideas, the A2-PRO professional-grade headphone amplifier has a professional-grade monitor sound quality and sound in one step. G1217 consists of two audio enthusiasts, Myself (Jeremy H) based here in the US and our electrical mad scientist (Frans G) across the pond in the Netherlands. Myself, I handle the physical designs and actual products you receive from G1217. 6N11 6N6X2 WCF Class A AMP pure tube headphone amplifier DIY HIFI Kits This is DIY KIT, you need to solder it by yourself. and the price not contain tubes and ALPS potentiometer, please Note. The board tube can be upgrated Russia 6H6nX2 Czech E88CC,if you want pls mail me.! Features: 1. WCF circuit Kits. 2. The tube have High input impedance,install in case and GND is required. 3. WCF Class A working condition, a relatively low output resistance, can drive 32-1200 ohm headphones (recommended 50-600 ohm). 4. Circuit debugging is free, making ultra-simple, because the rational design, very low noise, switch machines without any direct impact. 5. Voltage requires two groups, one group is the filament AC6.3V (1A-2A)，another is AC 180V - 230V. 6. PCB Size: 131X98MM, potentio. AUDIOPHILE MKP 4U7 400V 3% precision tinfoil capacitance. This amp is base on Beyerdynamic A1. With 30MVprotection current,delay 7 seconds output audio. we have test this amp with Beyerdynamic DT series headphones, AKG K501, K601, K701, Sennheiser Headphones HD Series, all has very good performance. Reference Beyerdynamic A2 circuit design，combined with the designers design ideas and improved A2-PRO professional headphone amplifier with professional-grade monitor sound quality. Headphone amplifier kit X1. Nobsound®——Douk Audio. HiFi Art-Elfidelity. Headphone Amplifier. Hi-Fi Tube Amplifier. Integrated Amplifier. Digital Amplifier. Audio HiFi & DIY. AV Tube Integrated Amplifier. PCB size: 254mm 190mm 2mm. we are not responsible for tariffs and duties. 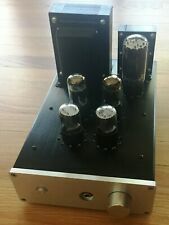 One pair KG Source File/ Kevin Gilmore balance Class A headphone amplifier kit. International Talent Kevin Gilmore original design. Applicable Headphone Impedance:32-600ohm. the following is the finished headphone amp.